Beset by fans’ apprehension and White House petitions over the casting of Ben Affleck as Batman, Warner Bros. CEO Kevin Tsujihara took it upon himself to reassure his investors, lest we see a repeat of the 1929 crash spurred by that year’s casting of Hoot Gibson in Smilin’ Guns. While we already knew that this Batman would be slightly older, more established, and thus be another father figure to a Man Of Steel who could really use at least one more of those to brood about, now we also know he won’t be all that into being Batman, so that sounds like fun. “[He’s] kind of tired and weary and seasoned and been doing it for a while,” Tsujihara said, really selling it. 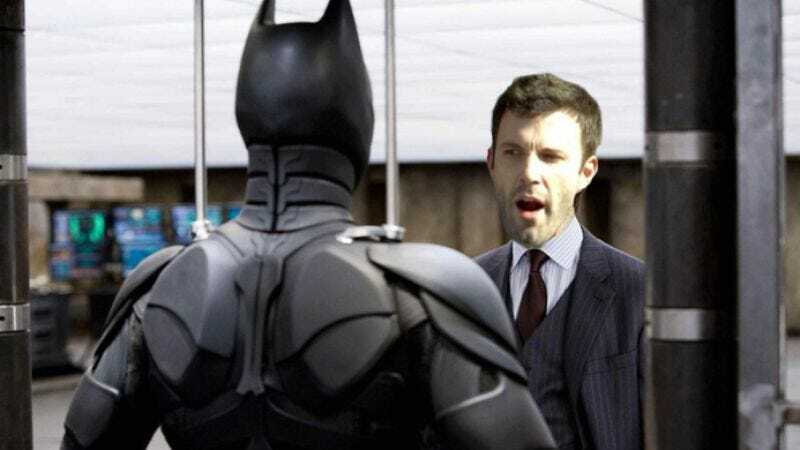 Tsujihara then reiterated that Affleck “is perfect for the vision” of an exhausted Batman who’s already accomplished plenty and therefore maybe deserves some form of rest and retirement for a while, but who’s instead dragged back into the business by forces beyond his control, all because Superman needs his help. To prepare for playing a Batman who’s completely worn down by the ungrateful populace he now so warily serves, Affleck will read the Internet.